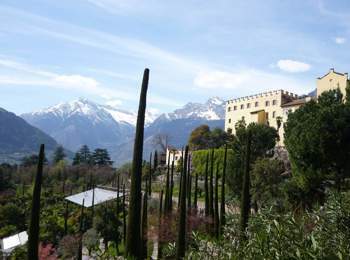 The Gardens of Trauttmansdorff Castle are South Tyrol’s most popular destination. They are featuring over 80 garden landscapes in a singular fusion of nature and art, offering flowering highlights which are chancing every season as well as the breathtaking views on Meran and the mountains around. The Gardens of Trauttmansdorff Castle are organized in 4 different themes. The first one is “the forests of the world”. Here you see multicoloured rhododendrons and peonies blossom, while in summer you will be amazed by countless day lilies in the Japanese lake landscape. In autumn the forests are a marvellous spectacle of colours and crops ripen on the Rice Terraces. The second area is called “the landscapes of South Tyrol”. Tulips, narcissus, grapes, apples, chestnuts and vines are South Tyrolean’s contribute to the most beautiful gardens of Italy (2005). In “The Sun Gardens” there are more than a thousand tulips from a sea of flowers beneath the “Sissi-Promenade” each spring. In summer grow colourful dahlias and perennials here, while the Olive Grove is dominated by the gold tones of countless sunflowers. In autumn, however, Mediterranean fruits ripen, including pomegranates, figs, wine grapes and olives. Last but not least we have to mention the “Water and Terraced Gardens”, where in spring camellias, open their elegant flowers in the Palm Garden. You can watch at a sea of peonies and English roses already in early summer. Many-coloured shrub borders ornament the various terraces; water lilies and lotus flowers lend a touch of exotic to the Water Lily Pond. You see the Gardens of Trauttmansdorff Castle are more than a Sunday afternoon trip, but a really singular and most of all unforgettable experience.